With its Bohemian themes, heartbreaking songs and passionate tales of pain and love, Rebetiko, or the Greek blues, is an intoxicating musical style. Created over 100 years ago by Greek refugees it is thriving again across the globe as a diversity of artists create unique interpretations. Catch some of the finest Rebetiko musicians from Greece, U.S.A., Japan and Australia at the annual Melbourne Rebetiko Festival at Melbourne Recital Centre on Saturday 23 March 2019. Headlining this year’s festival is Athenian band Rebetien. Athens remains the epicentre of Rebetiko and Rebetien has become a fixture in the world-music festival scene in Europe, introducing music- lovers to a wealth of authentic and rarely heard Rebetiko songs and themes. 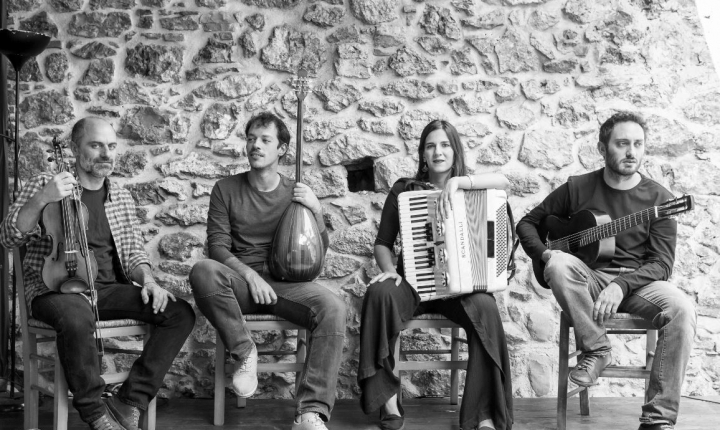 Combining the accordion, bass-guitar, bouzouki, double bass and violin, it blends original compositions with an array of captivating Middle Eastern, Eastern Mediterranean and Balkan tunes. Another international highlight is Atsushi Tookaya from Tokyo, Japan. Atsushi’s pathos and verve make him an incredible bouzouki (Greek string instrument) player and multi-instrumentalist. Joining him for his Melbourne Rebetiko Festival performance are Rebetiko masters Irene Vela (Habibis), Mairead Hannan (Xylouris Ensemble) and Paddy Montgomery. (Melbourne) performs the century-old songs of Smyrna (Izmir); The Bouzouki Orchestra led by Dean Georgalas delves into the repertoire of Giorgos Zambetas; and the well-loved Melbourne Rebetiko Ensemble brings together Achilles Yiangoulli, Con Kalamaras, Dean Georgalas and vocalist Agapi Gioftsidis. Melbourne Rebetiko Festival is an unrivalled opportunity to explore the rich tapestry of Rebetiko in closer detail and immerse yourself in the remarkable stories that brought it into being. Rebetiko first spread among the urban working-class populations in Smyrna (Izmir) and Constantinople (Istanbul) at the turn of the 20th century and was the voice of the dispossessed and outsiders, including refugees. It was not just music, but a lifestyle. Rebetes were bohemians and multiculturalists. Many took to heroin, cocaine, booze and hash. The pioneering female Rebetes flaunted their pan-sexuality and distain for Orthodox conservatism. Numerous Rebetes were jailed and their music was banned. From this incredible position at the edge of society, Rebetes created a musical explosion. The earliest recordings by Rebetes emerged in Manhattan, in studios specialising in bluegrass, jazz and blues. Now Rebetiko is ignited by all sorts of modern influences such as rap and pop, making performances ever more fluid and inventive. Paying homage to tradition and embracing the originality of today, Melbourne Rebetiko Festival is an unmissable celebration of this spell-binding artform.